For the fifty years prior to 1927, the struggles in the Colorado mines had been a flashpoint for labour relations throughout the mining industry and had been marked by many strikes, aborted uprisings and confrontations between miners and mine owners, and the state militia. The presence of the state militia in many strikes of course made the coal mine disputes not only memorable because of the heroic actions of the miners, but also because confrontations, more often than not, led to the spilling of worker's blood. One of the most well-known strikes of this nature was the Ludlow strike of 1914, where 17 workers and members of their families were murdered by the militia. The subsequent actions of workers across the state after the attack at Ludlow had created one of the largest uprisings by workers in American labour history, with whole towns being occupied by armed miners. 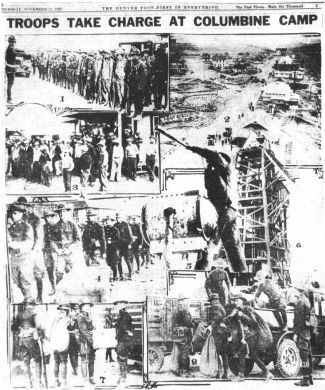 However, although this history of labour unrest in the Colorado mines had brought about some gains for workers, the severe repression the miners faced had enabled their employers to, on the whole, ignore the miners' demands, so under these circumstances, conditions and wages had not changed considerably. Another of the most well remembered strikes of the time was the mine strike of 1927, and the subsequent massacre of workers by the militia at the Columbine mine. As they had remained since the late 1800s, conditions in the mines were deplorable, and large accidents often leading to scores of deaths were common. In 1917, 121 miners had been killed in an accident at a mine in Hastings, two years later 31 miners were killed in explosions at the Oakdale and Empire mines and in 1922 and 1923, 27 were killed in mines in Sopris and Southwestern. Individual accidents resulting in deaths were almost daily occurrences. Conditions of pay weren't any better, with many miners often being paid in scrip, money which was only redeemable at company owned stores in mining towns. Workers had to pay for their own tools, blasting powder and were not paid for "dead work", which was work that was not directly mining for coal, but important to the mine nonetheless, such as timbering supports to keep the mine safe. Miners in Colorado had observed a general strike called by the revolutionary syndicalist union the Industrial Workers of the World (IWW) in 1927 in support of the arrested anarchists Sacco and Vanzetti, who were executed in August of that year and later in the year, taking notice of the continuing discontent amongst the miners, the IWW called a strike of all mine workers on October 18. The striking miners shut down every one of the coal mines in northern Colorado except the Columbine mine, situated just north of Denver in a small town called Serene, which was being kept running (albeit with a very slow rate of production) by 150 scabs who had been brought in on the promise of a fifty cents a day increase in pay. The imported scabs were housed in Serene, which had been turned into something resembling a fortress, with barbed wire on the fences and armed guards at the gates. All in all, 113 mines across the state had been closed, with 13 still running. The majority of miners in the state were on strike, about 8,400. As in Columbine, the 1,750 scabs who were keeping the 13 remaining mines open were lured away from the strike by promises of increased pay and other such incentives. However, frequent mass gatherings on the coalfields in the south of the state brought more and more of the miners still at work out to join the strike. Picket lines were almost constantly harassed by the police, and arrests were frequent. Union halls were closed, often violently, and arrested strikers were moved from one jail to another to prevent access by IWW lawyers, while many were just driven to the state line and left there. The imprisoned IWW members however, did not stay silent in the jails. A number of them participated in demonstrations from inside jails and on one occasion, workers from the Lafayette mine refused to leave a jail they had been placed in because, as they anticipated, that on their leaving they would just be replaced by more arrested miners. Since they had grown acclimatised to the cells, they thought it best to stay so as there would be no room for other strikers to be locked up. Another group of jailed miners even managed to convince their jailers to form a deputies' union to obtain better wages and conditions. The local press launched frequent attacks on the IWW and the strikers from their pages, often using the diverse nationalities of miners involved in the strike to stir up racial tension. The IWW leaders were also often smeared, being described by one paper as "tramps with their pants pressed". By and large these attempts to discredit the strike failed, and the communities local to strike centres mostly ignored them. In the south of the state, the company that owned most of the local mines, Colorado Fuel and Iron (CF+I), had been at the 'bargaining' table with the company controlled 'union' that had been in place since the Ludlow strike. The company union was granted a 68 cent a day increase and a resolution was unanimously passed by the 'workers representatives' to fire any IWW members on the payroll. These actions played a large part in breaking the strike in the south. The Columbine mine, still the only mine in northern Colorado remaining in operation became a focal point of attempts by the company that owned it, the Rocky Mountain Fuel Company, to break the strike in the north. After five weeks of strike action and economic stagnation for the mine owners, they became increasingly desperate to find a way to end the strike quickly, and many more police and National Guardsmen were drafted into Serene, bringing with them weapons including several machine guns. Mass rallies had been held by workers outside the Columbine mine in Serene for several weeks and on the morning of November 21, about 500 miners and their families marched towards the north gate of the town. On their arrival, they were met by plainclothed militiamen with rifles, blocking the entrance to the gate, backed up by mine guards inside the town also armed with rifles and tear gas grenades. Upon being refused entry into the town and after a short discussion, the miners asserted their wish to enter, telling the militiamen that many of them had children in Serene's school, that they needed access to a public post office in the town and that they still had a right to hold rallies. With the militiamen still refusing the open the gate, Adam Bell, a strike leader, approached the gate and was struck on the head with a baton. As he fell to the floor, the miners surged forward to protect him as he lay unconscious. Tear gas canisters were fired by the militia, and many were thrown back by the rushing miners. The strikers began to scale the gate and a battle soon ensued, with police beating the miners back and seriously injuring several people, including a mother of sixteen, while the miners fought back with rocks. The militiamen and police sustained minor injuries, the general consensus of the day amongst the IWW men had been to leave their weapons at the union hall or at home. Eventually, the miners forced their way through the gate, and many began to scale the fences around the gates. The police retreated about a hundred yards inside the town, and fired into the mass of surging strikers with their rifles and at least two machine guns. The miners quickly scattered, but at least six people had been killed and more than sixty injured by the hail of bullets, several seriously. The miners also later claimed that not only were they fired upon by the retreated police line, but also from another machine gun positioned at the mine tipple on their flank, which would have created a devastating crossfire. The massacre at Columbine was not the last instance of violence against miners during the strike, with two strikers being killed in Walsenburg two weeks later, as well as numerous attacks on pickets and union halls. The owner of the Rocky Mountain Fuel Company, Josephine Roche (a liberal, who recognised the need for a union, so long as said union wasn't the IWW), brought an end to the strike several weeks after the incident at Columbine, declaring that the company union was to be affiliated with the American Federation of Labour, as well as eventually recognising the United Mine Workers of America (UMWA). The UMWA, whose members had responded to the massacre at Ludlow thirteen years previously with such a stunning show of aggression against the Colorado mine owners and authorities, collaborated with the owners at the Rocky Mountain Fuel Company for token improvements in pay and conditions for years proceeding the end of the strike. However, the backbone of IWW support in the Colorado mines had been broken by the companies, and the union would never return to such prominence in the industry again. Rather unsurprisingly, no militia or policemen were ever held accountable for the massacre at the Columbine mine, the only physical reminder of the attack being a small monument at the site of the shootings. However, the striking miners and the victims of the militia's bullets will always be remembered as the manifestation of decades of struggle in the Colorado coal pits, which, while having limited actual accomplishments, was one of the finest examples of mass working class action in American labour history. I'm a member of Occupy Lafayette Colorado and also a Libertarian Communist and IWW member. So good to see this on your site. Thank you! Solidarity from Old Town Lafayette Colorado USA! I am very pleased to see this post. Adam Bell, mentioned strike leader, was my grandfather and although I never knew him I have heard of his valiant efforts for the sake of miners on both sides of the border. This strike left him beaten and left for dead, he survived to continue his passion for safer mining conditions and change of the conditions that made the Coal Baron's and Company's rich on the backs of their men. hey, that's really cool, thanks for posting here and good on your grandfather!